On December 11, 2017, Johan Schwartz drifted an F90-generation BMW M5 sedan 232.5 miles around a skid pad at the BMW Performance Center in Greer, SC. It took eight hours of continuous drifting to complete, which is almost difficult to comprehend. That’s the length of your typical work day, except the entire time you’d have to be holding a drift in a 600 hp super sedan. The concentration level to even attempt such a feat is unfathomable to me. On that day, Schwartz set a Guinness World Record for the “Greatest Distance Vehicle Drift” Even more, BMW also broke another world drift record that day for the world’s longest “Twin-Vehicle Drift” (water-assisted), with two BMW M5s drifting 49.25 miles over the course of an hour. For this, both Schwartz and BMW Performance Center Chief Driving Instructor Matt Mullins drifted new M5s around the skid pad together. But despite how impressive both of those records are, what’s even more impressive is how BMW achieved the longer drift record. To keep a 600 hp V8-powered sedan drifting for eight hours, BMW needed to figure out a way to refuel the car mid-drift. So the F90 M5 driven by Johan had a dry-break fuel system fitted to it an another car had to drive up and connect to it to refuel. To actually pull this off, Matt Mullins was tasked with driving an F10-generation BMW M5 and matching Schwartz’s drift while a man who was in the back seat of the F10 and suspended by a safety tether, had to connect the fueling system. It’s all very impressive stuff and it drove the internet wild for a few days afterward. So I recently spoke with Matt Mullins about being a part of breaking drifting records and how difficult it was to refuel the main car mid-drift. BMWBLOG: First, congratulations on the record. 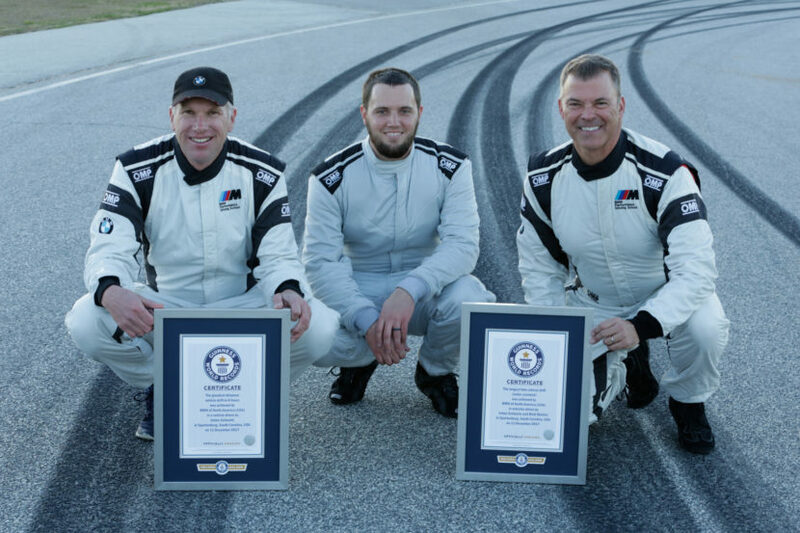 How does it feel to have been part of breaking two drifting world records? Matt Mullins: If feels great. After more than a year and half discussing and planning it’s very satisfying to get the results. BB: The twin-vehicle drift record you were a part of lasted an hour. I can’t concentrate on something for more than 20 seconds, how hard is it to concentrate on holding a drift for that long? MM: It was pretty intense drifting in close proximity at the end of a long day of focus. Johan had already been in the car for almost 7 hours and I was coordinating the logistics and doing the refuels. BB: For the longer eight-hour drift by Schwartz, you were in charge of driving the refueling car. That actually seems like it might be more difficult than actually drifting around. What were the challenges with that/how did they differ from just drifting? MM: I was the only one of the three of us who could really see the whole picture. Johan couldn’t really see me and Matt Butts [the refuel guy] except for slight glimpse in his mirror. So I was calling the action while working to maintain the distance to Johan’s car. BB: In the video, we see the two cars bump together a couple of times, were there any really scary moments while trying to refuel the F90 M5? BB: Both of the record-breaking drifts were really long, how many attempts did it take to break the record? MM: Both records were achieved on the first try. BB: Even with water-assistance, eight hours is a really long time to spin those rear tires. Was there an issue with tire wear/damage? Also, which tires were the cars running? MM: The tires on both cars are Continental Extreme Contact Sport. The same set of tires from the drift world records or still on both cars. There’s even some tread left after our big burn out at the end.